ORBIS TERRAE COMPENDIOSA DESCRIPTIO - ROSSACIO, G.
Title : ORBIS TERRAE COMPENDIOSA DESCRIPTIO. Map maker : ROSSACIO, G.. Size : 6.8 x 9.8 inches. / 17.2 x 24.8 cm. 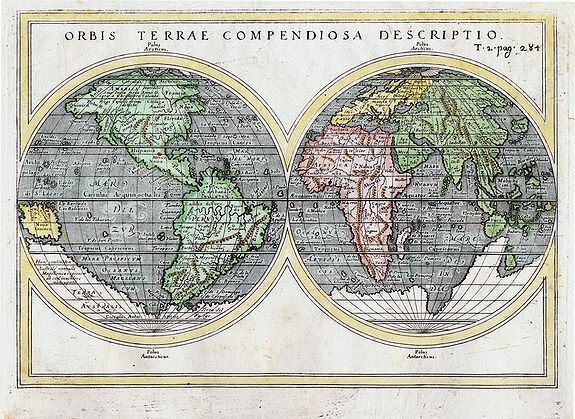 Description :Attractive double-hemisphere map of the world based on Mercator's monumental map from 1587. It first appeared in Rosaccio's 1598 edition of Ptolemy's Geographia and was later re-issued by Lasor a Varea in their Universus Terrarum Orbis Scriptorum, in 1713. With interesting geographical features: South America still has the westward bulge and California is connected to North America. North America is shown in broad regions of Francia Nova in eastern Canada and Florida covering the eastern portion of what is now the United States. Curious shaped Florida. The southwest of the North American continent is called Gallica Nova and northern Mexico is Hispanica. The St. Lawrence River is clearly shown, but the Great Lakes seem to be unknown. Hudson's Bay is merely suggested. A note on Christopher Columbus with the date of 1492 is shown under the general title of America on the North American continent. The open sea south of Tierra del Fuego had not yet been established; the only passage from the South Atlantic to the South Pacific is through the Straits of Magellan. Terra Australia is shown as part of one large southern continent, and the fabled Northwest Passage is shown as a clear, if optimistic, route. An attractive example of this classic map. Condition : Excellent clean copy with dark impression. Top margin narrow. Margins with some faint toning. Only very light soiling and a few printers scratches, nice & attractive condition.